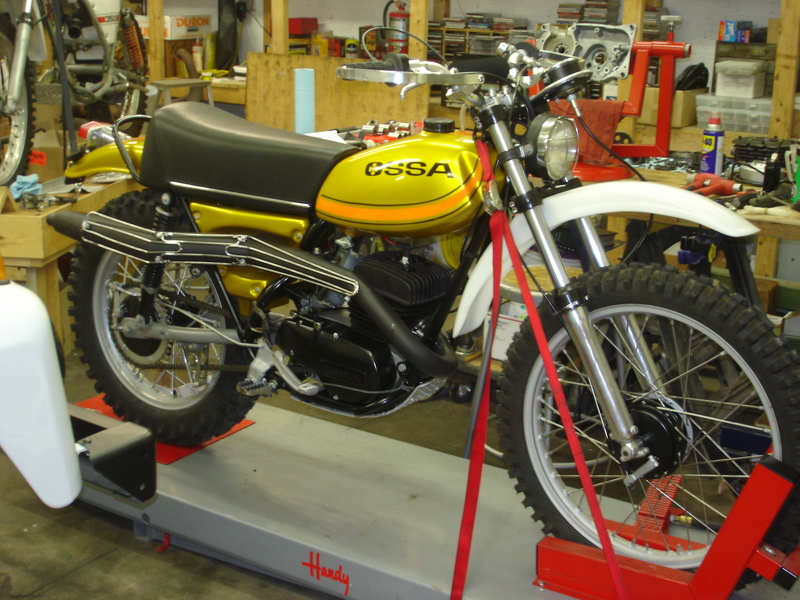 Jim Bought this at mid-Ohio in 2007 from none other than Hugh Weaver of Bultaco Motorcycles. It was pretty original and complete, but thoroughly worn out! I mean everything! Bearings, bushings, brakes, shocks, crank, primary chain and cush hub, clutch parts, sprockets, etc. We rebuilt, replaced, recoated every part – trying to make it dependable for riding. Karl helped us find a “Hoss” plastic tank, plastic front fender and “narrow” alloy handlebars for Enduro riding. The work was completed in 2009, but Jim never made time to ride it. We displayed it at the Broom Factory til fall of 2013 when Rob Meadows picked it up. He plans to ride some dual sports with me next year – yeah! More OSSAs on the trail!